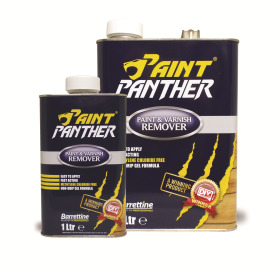 Paint Panther from Barrettine is a highly-effective, paint and varnish stripper that is designed to work fast to remove many types of coatings quickly and effortlessly, including metalised paint. It has a gel consistency, which is ideal for vertical and other less-accessible areas that require treating. Previously named DIY Week’s Decorating Product of the Year, Paint Panth’s award-winning formula has never changed. Available in five sizes: 250ml, 500ml, 1 litre, 2.5 litre and 4 litre. Great retail prices available, says Barrrettine. Call the sales office for further information or to place an order.